Hello again. I know, I was just here a few days ago, but I was asked by fellow Sin City Scraps design team member, Pam Bray, to cover her post today. Never fear, however, because Pam will be back in two weeks with another fabulous project to share with you. 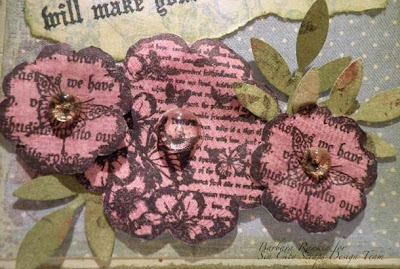 Today, I am going to make an altered art project for you. Do you remember these? It is a microscope slide holder. Some years ago, these were a really hot item. 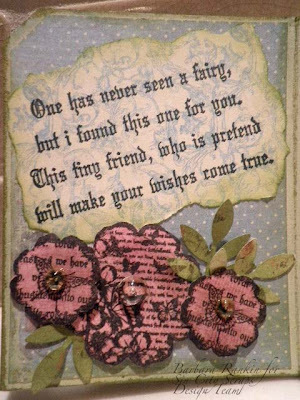 I am going to show you that they can still be a fun item to alter, so look through your stash and see if you still have any of these hidden somewhere. If you are like me (and you know who you are) you never throw anything away. 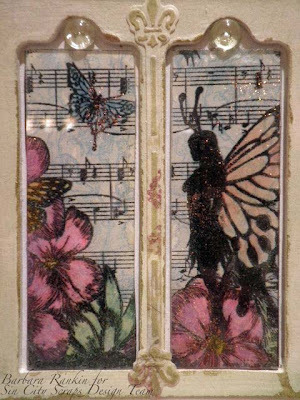 I have been dying to use these Fairies Plate 2 set of stamps ever since I got them, and I am so very happy the way this turned out. So, let's get started. 1. Paint slide holder with white acrylic paint. 2. 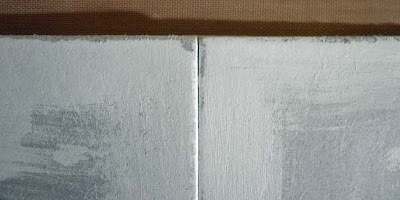 Sand back some of the paint for a grungy look. 3. 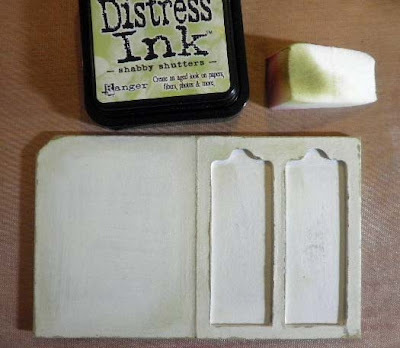 Distress edges of slide holder with Shabby Shutters and Peeled Paint ink. 4. To cover the holder, trim three papers to approximately 2-3/4" x 3-1/2". Adhere one piece to back outside cover. 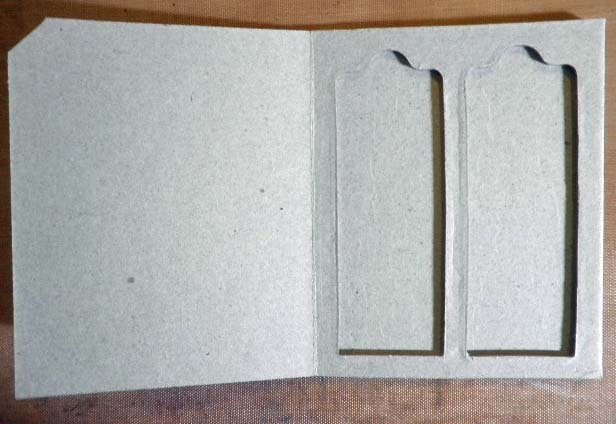 Snip off corners of remaining two pieces and adhere pieces to front and inside front covers. 5. 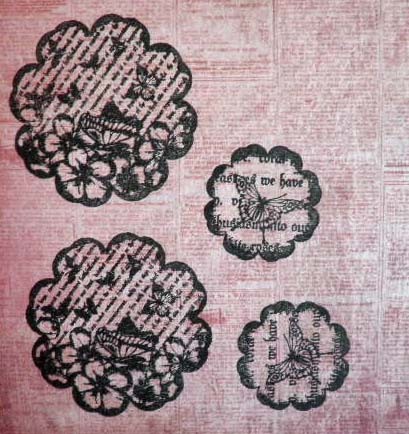 Die cut two label shapes and fleur de lys accent piece from print paper, distress with Shabby Shutters distress ink.6. 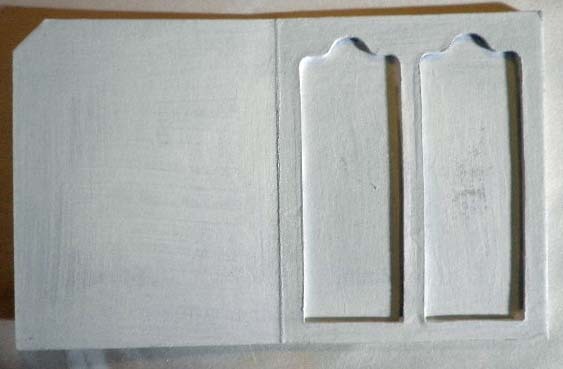 Layer both label shapes to front cover, and fleur de lys piece between microscope slides. (See front cover and inside pictures above). 7. 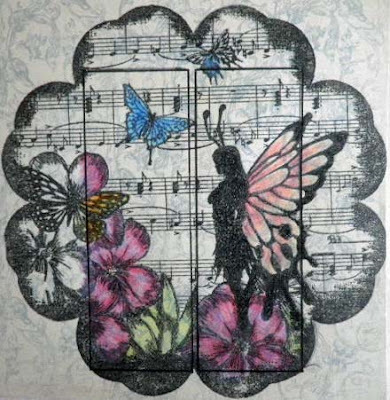 Stamp image from Fairies Plate 2 with black archival ink onto printed scrapbook paper. 8. Trace around two microscope slides and color image with colored pencils. It is easier to color the image if you leave it intact. 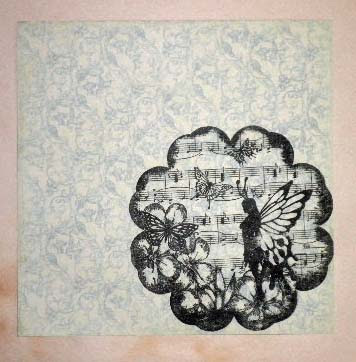 It is so much fun to stamp onto pre-printed paper, such as this. The colors will mix and mingle with your color variations. 9. 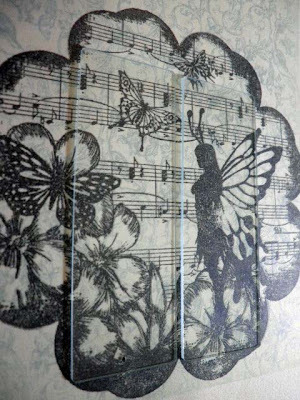 Cut out both rectangles and lay flat on craft sheet. Apply glossy accents to glass slides, sprinkle lightly with ultra fine glitter, and adhere to each rectangular image. The bit of glitter really makes it look more like fairy land. (See close-up of slides picture below). 10. Glue each slide into the openings and a couple of dew drops at the top. 11. Stamp fairy and fairy wings onto print paper. 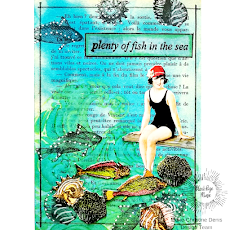 Color with pencils and fussy cut both. 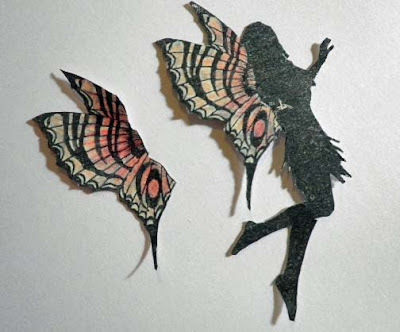 Layer wings onto fairy for dimension and glue whole fairy image to front cover. 12. 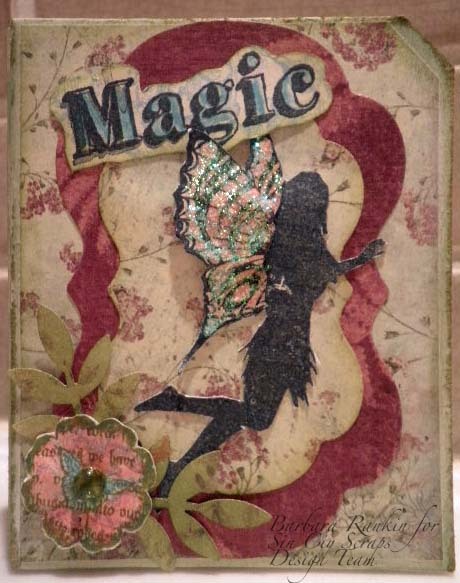 Stamp "Magic" and "never seen a fairy" phrase onto print paper. 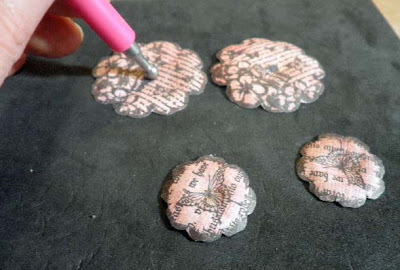 Trim "Magic" with scissors, and tear out the phrase. 13. Adhere "Magic" to front cover, and phrase to inside front cover. 14. 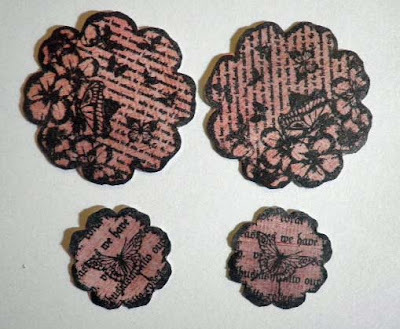 Stamp fairy flower images in two sizes onto printed paper. 15. Cut out each image. 16. 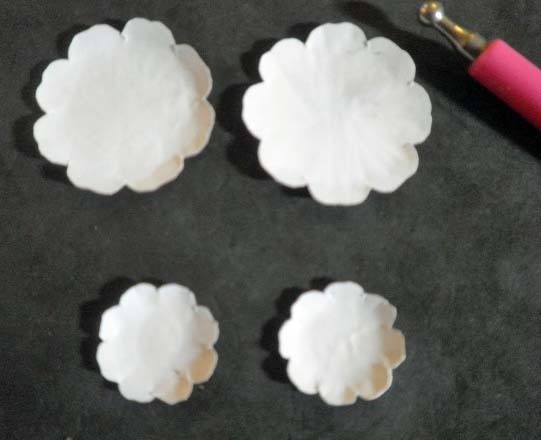 Place flowers face down on a piece of foam and begin to shape each one with a large ball stylus tool. 17. Turn the flowers back over to the the right side and cup the flowers only in the middle. 18. 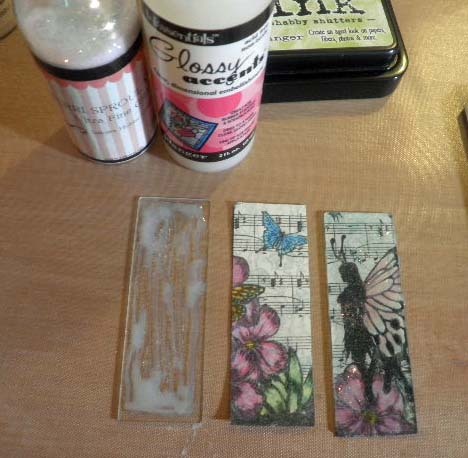 Punch a few leaves using any leaf punch and add a bit of peeled paint distress ink. Layer and arrange your flowers and leaves, as shown. Add dew drops to the flower centers. 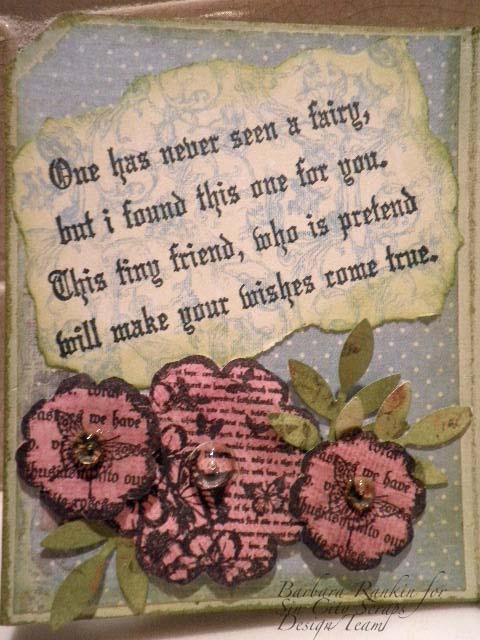 I hope you have enjoyed my altered project today, and that you will be inspired to find some of those "oldies but goodies" items in your stash to make some beautiful art. 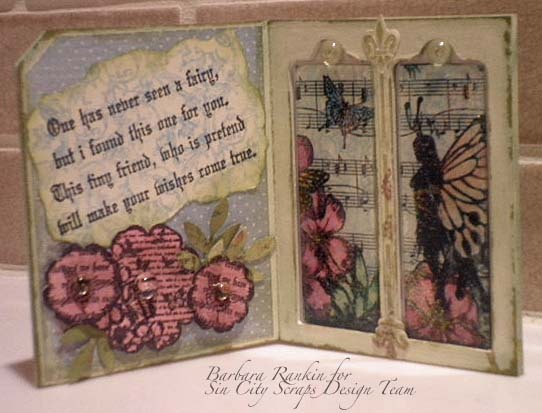 I hope you will take some time to visit the Sin City Scraps online store, and stop back by the blog for more inspiration from the wonderfully talented design team members. 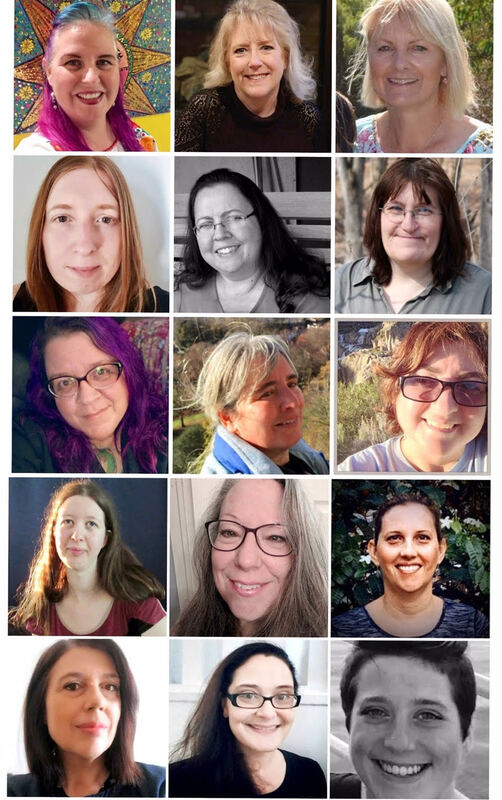 Thanks so much for stopping by, and have a wonderful, creative week.